My son [Gen Y] likens cross stitch to ‘pixel art’ and I can see his point. I have teamed this rather impressive cross stitch of deers in their natural habitat with two bambi planters. Together they make a great ensemble. The bambi planters can – indeed- hold plants or utensils, etc and they are in good condition. The cross stitch- by some unknown pixel artist of the 1960s, is framed and ready to hang- and likewise is in good condition. 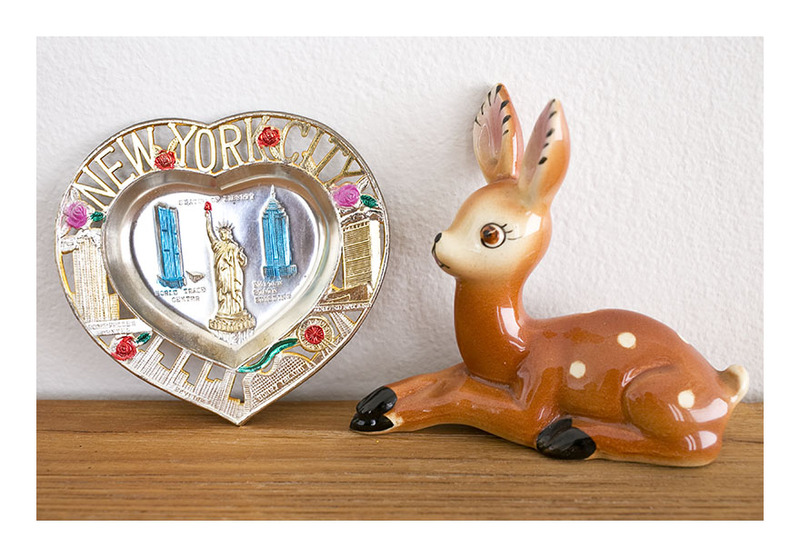 Really getting into deep kitsch territory now: reclining Bambi, made in Japan c 1960s and an aluminium souvenir pin tray from New York City, also c 1960s. Back when the World Trade Centre was still standing [and a rather astonishing colour of blue!] this pin tray was cheap, mass-produced and light weight- perfect as a travel gift. I’m impressed by the cut-outs, and the fact that alongside the memorable buildings, Coney Island gets a mention – you can see the big dipper and ferris wheel at the bottom right of the dish. And roses. What’s the association of NYC and roses? Perhaps just another way to introduce some random garish colour. Either way, Bambi looks quite impressed! Another Bambi- I hear you cry- yes indeedy! I do love Bambis. You can tell the origin of your Bambi by the insect on its back- if it’s a butterfly [as on the cover of this Little Golden Book, printed 1956] it’s an American Bambi. In Australia, Bambis produced by Disney have a lady beetle on their back. I have no idea what market this planter was intended for- that looks to be a lamb on Bambi’s back! A very mixed metaphor. None-the-less this Bambi is in fine fettle and ready to add to your already burgeoning Bambi collection. It is unmarked, except for the ‘made in Japan’ stamp on the underside. For you delectation today we have a collection of childhood memories from the 50s. The View Master- a perennial favourite- comes with a 3D ‘Bambi in the Forest’ reel- featuring picture stills from the famous movie. The needlepoint features the famous Disney characters in a rubber dinghy and it’s in a delightful 50s frame. And the rocking clown makes that classic- slightly eerie- tinkling sound when it moves. 50s classics all! 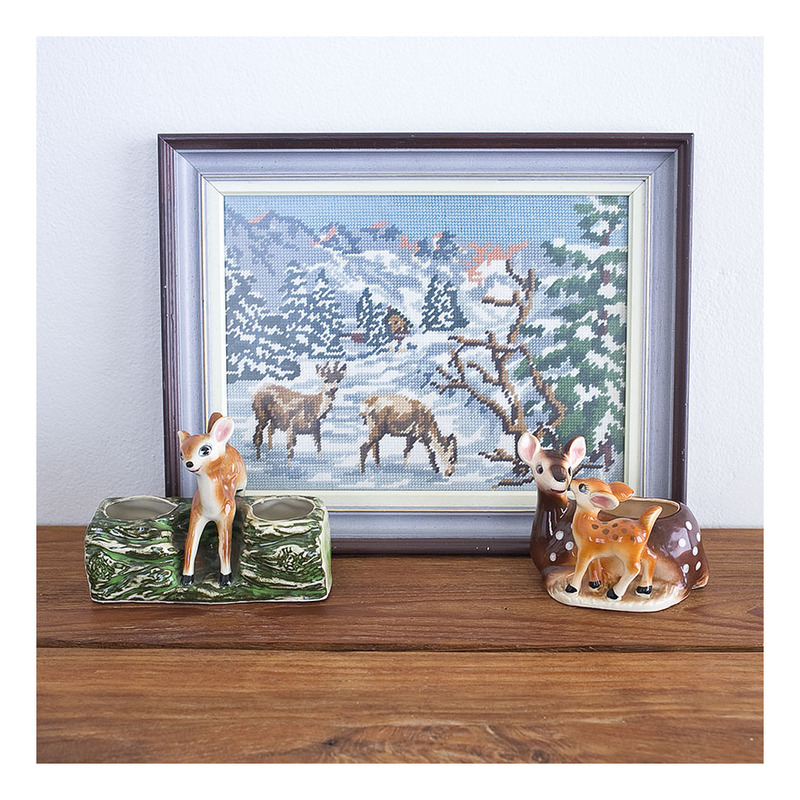 Bringing together my three loves: bakelite, bambi and view-masters- this set is all about nostalgia. When I was a young ‘un, I absolutely wanted a View-Master. But they were prohibitively expensive for my family- so wanting was as far as I got. I think nostalgia is often rooted in the thwarted desire- it’s only as an adult that one can afford to buy something denied in one’s youth. 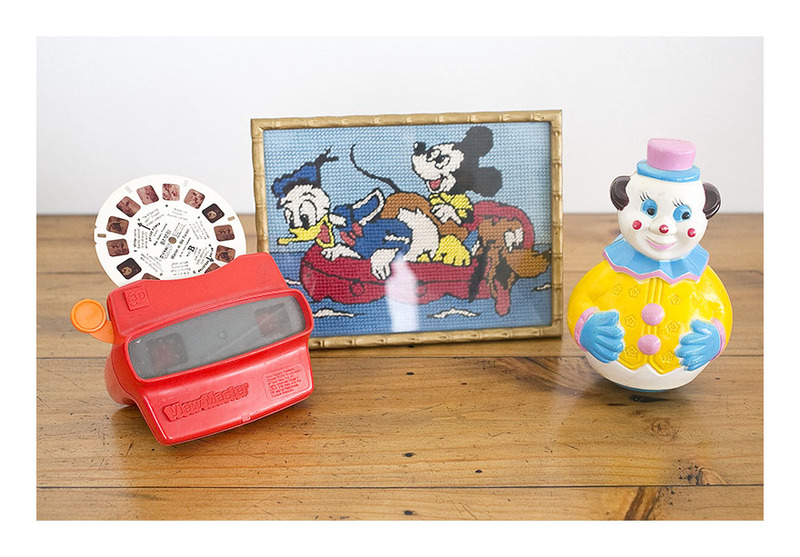 The internet is awash with View-Master collectors and memorabilia. Reels for the View-Master are widely available. Indulge your nostalgia- or- add to your burgeoning View-Master collection! Bringing together my love of Bambi, 60s Americana and – weirdly- botany, I present to you this wonderful lithograph- by a B. James [as signed in the b.r.h. corner.] 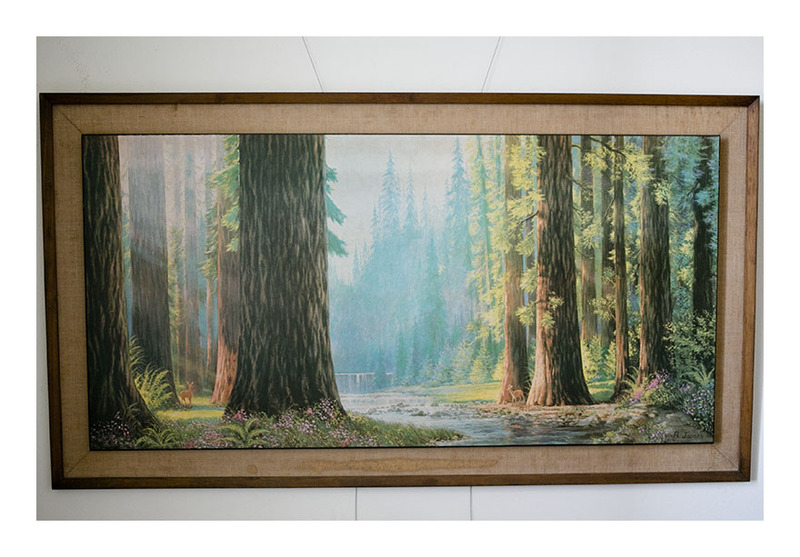 The image measures 48” x 24” [1.21m x 0.6m] in a timber frame, mounted to stand proud of the hessian backing. The total size of this beauty: 54” x 30” [1.37m x 0.76m] – how good would it look hung over your Parker sideboard? Two Bambis stand dwarfed by the Giant Sequoia trees as the morning sun glistens on the idyllic scene. To say the image references the Garden of Eden is to state the obvious- so one Bambi is clearly Eve, the other Adam. Or this is the sixth day of Creation, before those pesky humans showed up and ruined it all.